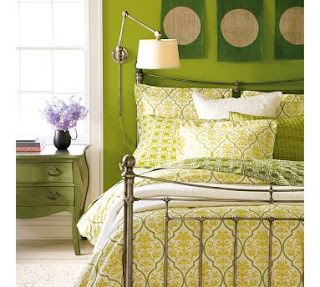 I just love this bedding from the Pottery Barn. If you want the real deal, you can get it here. As for me, I'll just have to keep my eye out for a really good sale somewhere a little more in my league...maybe some cool vintage store. Anyone know where to find one of those? No but if you find it let me know because I am looking for the same kind of deal. I am trying to make my bed spread. I have a few cute fabrics but I need a couple more to make the design I want.